The court security unit is comprised of 20 full and part-time Deputy Sheriff Court Bailiffs. These bailiffs provide security to two General District Courts, two Juvenile and Domestic Relations Courts and three Circuit Courts. In addition, bailiffs provide security for the Virginia Court of Appeals approximately 25 times a year when they meet in the Roanoke County Courthouse. The court bailiffs assure the safety of judges, court staff, visitors, and prisoners by supervising conduct and keeping watch over court proceedings. 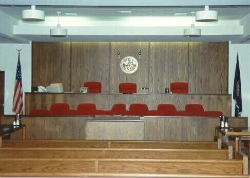 Some of their duties include opening and closing court sessions, calling cases appearing before the court, providing service and assistance to the judges, transporting inmates to and from court, maintaining a supply of jurors for jury trials, writing parking tickets and serving arrest warrants. In response to today's increased threat to homeland security, the Sheriff’s Office has installed Security Screening Checkpoints at the main entrances of both courthouse buildings. These checkpoints consist of a metal detector and x-ray machine. This equipment supplemented with the hand-held detectors will prevent guns, knives and other dangerous weapons from entering the courtrooms and will help provide additional security for all persons utilizing the courthouse.